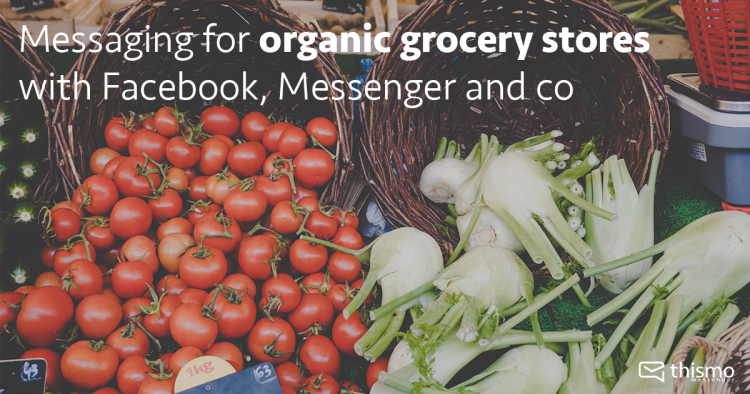 Messaging could be an enrichment also for organic grocery stores and supermarkets. You ask yourself how? First of all organic gets more and more important and in this context customers have a lot of questions. Where are the vegetables from? Do you deliver to my home? What are your opening hours? Do you belong to a supermarket chain? Are your products free of genetically modified organisms (GMO) and ingredients? And so on… Imagine you could handle all those requests reaching you from Facebook, Messenger, SMS, Web Chat and many other services with only one tool, how much easier it would be for you. Well, luckily you can! Your customers are able to get in touch with you from any messaging service. So, you can answer from the thismo messenger using our business gateway whenever you have time. You haven’t any social media, yet? No problem. You can also integrate thismo messenger on your website as a web chat or tell your customers at your store locations your messaging address. You plan a special event in your shop? Now you are able to use the messaging service to invite your interested customers easily any very efficient by sending them a message which will appear as push on their smartphones. Also, messaging creates a great channel to get in touch with your customers if you already have their phone number. Send them a SMS with your seasonal and regional cultivation and a link to thismo messenger. With a click they can send you requests for free from thismo messenger. Users are used to get information fast and easily and to access it flexibly and therefore messaging is the right tool. A gateway between supermarket and guest. A win-win situation, created through a more efficient workflow of the supermarket on the one hand and the fulfillment of the customer’s wish for flexibility on the other. Messaging breaks barriers and supports easy communication.